8 a.m. to 3 p.m. Retailers Promotion, Gladstone Roadand Peel Street. 3 p.m. Opening Navy Display Of Charts, Art Gallery. 8 p.m. Concert by Colson String Quartette, Girls' High School Hall. 9 a.m. 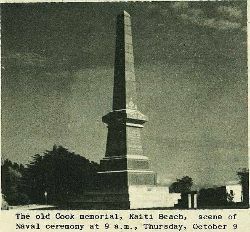 Naval Cerfmony at Cook Monument. 10 a.m. Floats assemble in Esplanade. 11 a.m. Parade Of Marching Girls. Bands And Floats. 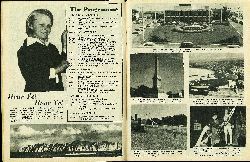 From Kaiti Bridge along Gladstone Road to Herbert Road, thence to Palmerston Road and Barry Park. Bands and other units on foot turn off at Grey St.
1 p.m. Official Luncheon at Y.M.C.A. 2 p.m. Rugby Park. Entertainment by Marching Girls and Civic Band. 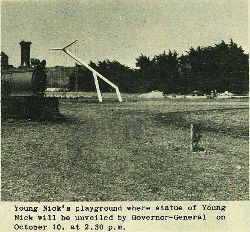 3 p.m. Official Government Function. 6 p.m. Government Reception at Y.M.C.A. 8 p.m. "Retreat" at Rugby Park, arranged by Navy. 8.30 Fireworks at Rugby Park. 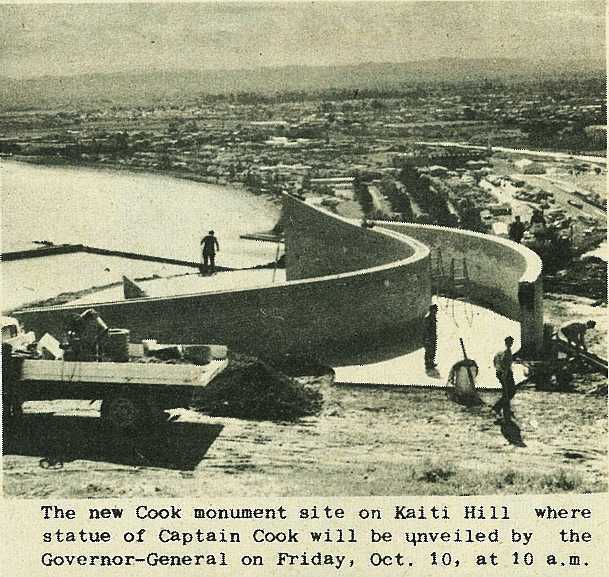 10 a.m. Unveiling Of Cook Statue, Kaiti Hill, by Governor-General. Noon. Presentation Of Totem Pole, Alfred Cox Park. 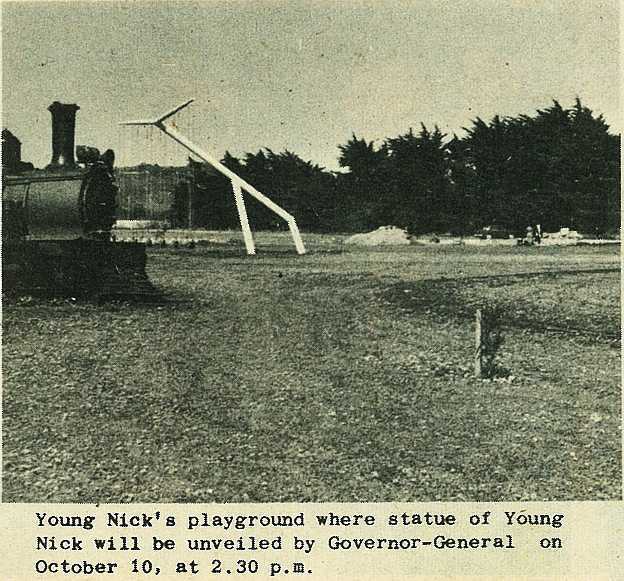 2.30 Unveiling Of Young Nick Statue at Young Nick's Playground, by Governor-General. 8.30 Bicentennial Ball. Sheepfarmers' Building, Innes Street. Floral Festival, War Memorial Hall. Service at Analtra Bay at noon. Morning: Lions Gala Day, Grey Street. 2 p.m. Air Pageant at Darton field. 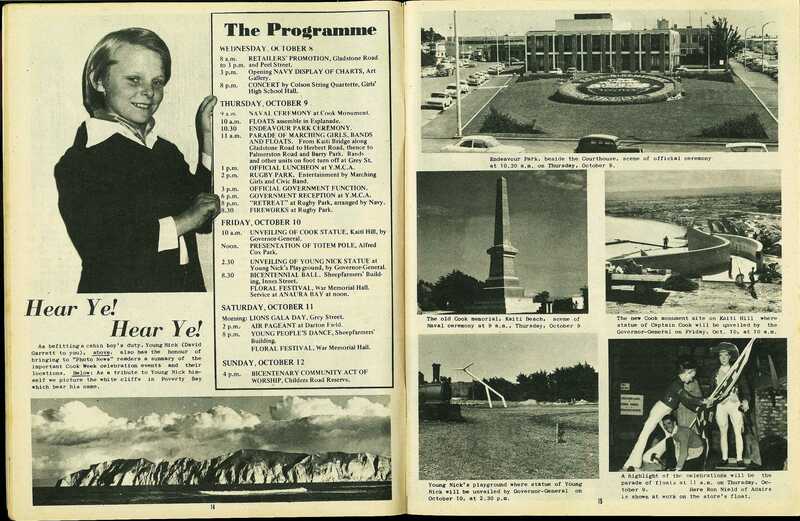 8 p.m. Young People's Dance, Sheepfarmers' Building. Floral Festival, War Memorial Hall. 4 p.m. Bicentenary Community Act Of Worship, Childers Road Reserve. As befitting a cabin boy's duty, Young Nick (David Garrett to you), above, also has the honour of bringing to "Photo News" readers a summary of the important Cook Week celebration events and their locations. 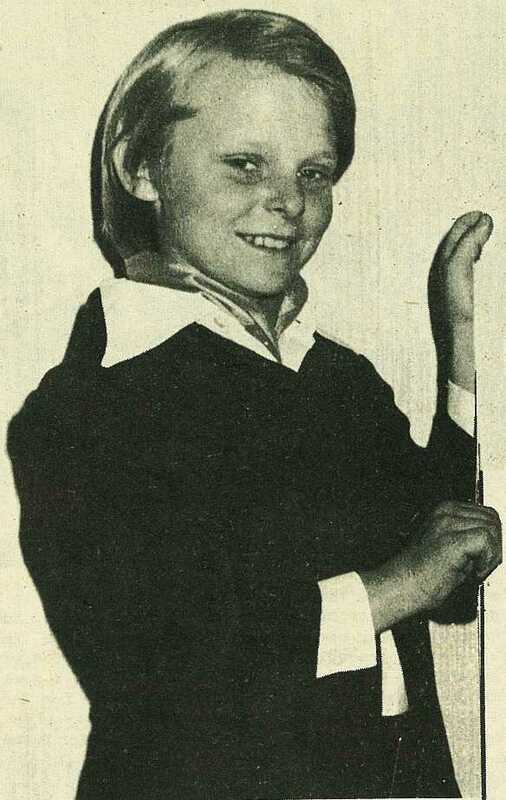 As a tribute to Young Nick himself we picture the white cliffs in Poverty Bay which bear his name. Endeavour Park, beside the Courthouse, scene of official ceremony at 10.30 a.m. on Thursday, October 9. 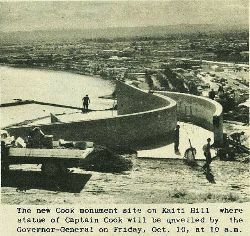 The new Cook monument site on Kaiti Hill where statue of Captain Cook will be unveiled by the Governor-General on Friday, Oct. 10, at 10 a.m.
Young Nick's playground where statue of Young Nick will be unveiled by Governor-General on October 10, at 2.30 p.m.
A highlight of the celebrations will be the parade of floats at 11 a.m. on Thursday, October 9. 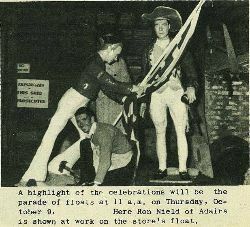 Here Ron Nield of Adairs is shown at work on the store's float.